Extract from Wiliam Beckford?s ?A Descriptive Account of the Island of Jamaica?.? 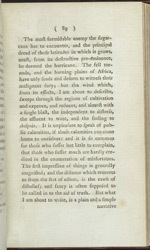 Here, he describes the devastation caused by a hurricane that swept across the island in October 1780. Many of the inhabitants of the town of Savannah la Mar were killed in the storm, countless buildings were torn down and much of the crop was ruined. He writes of the distress of the inhabitants and of their hard work in re-building their homes.